Coming from the north-east into Munich, perhaps one of the worst examples of 70th urban architecture awaits the traveler: The Arabella high-rising building, which harbours not only a large hotel of the same name, but office, medical practises and flats. What is less known: In the basement of this block once resided the most important music recording studio “Musicland”. It was of little domestic importance, because the innovative sound that sound-engineer Mack and pop-composer Giorgio Moroder produce there was more acknowledged by international stars like Freddy Mercury, ELO, Led Zeppelin and Rolling Stones. They recorded a few of their best songs and entire records at Macks and Moroders Musicland Studios. For some of them, a special regulation in the british tax-law might have played a role in their decision to come here and live and work for at least a year in Germany, thus evading the astronomic income taxes of the labour government. But to large degree, it was the special Moroder sound and the savior-vive in the Bavarian capital that made Munich so attractive to them. Freddy Mercury liked to take the tram in the afternoon, to drive down across the Isar river to hang around at the beer-garden “Chinese Tower”. The Rolling Stones produced the entire “Black and Blue” album at Musicland in 1975, but had enough time to meet Uschi Obermeier, the most enchanting of the Munich communards. At the end of the eighties, Mack and Moroder came under growing pressure from the property owner Schoerghuber, who tried to rise the rent for the studio. At the same time, a new subway-line was build, only a few meters aside the studio rooms. From now on, subway trains running along caused too much noise to permit further music recordings. Giorgio Moroder left Musicland and went to the US, and Mack relocated the entire studio to the Munich suburbs. About ten years later, rich Arabic families from the Emirates and Saudi Arabia discovered Munich as a save, convenient and pleasant place to spend the summer time, escaping the heat at home, spending large sums at daily shopping walks and visit high-class medical clinics for annual check-ups. It might be, that the Arabs were fascinated by the idea that the name “Arabella-Hotel” was a reference to their home. I tried with little success to shoot a picture with one of them, and the record cover of the Stones “Black and Blue” in front of the former entrance to the Musicland studios. 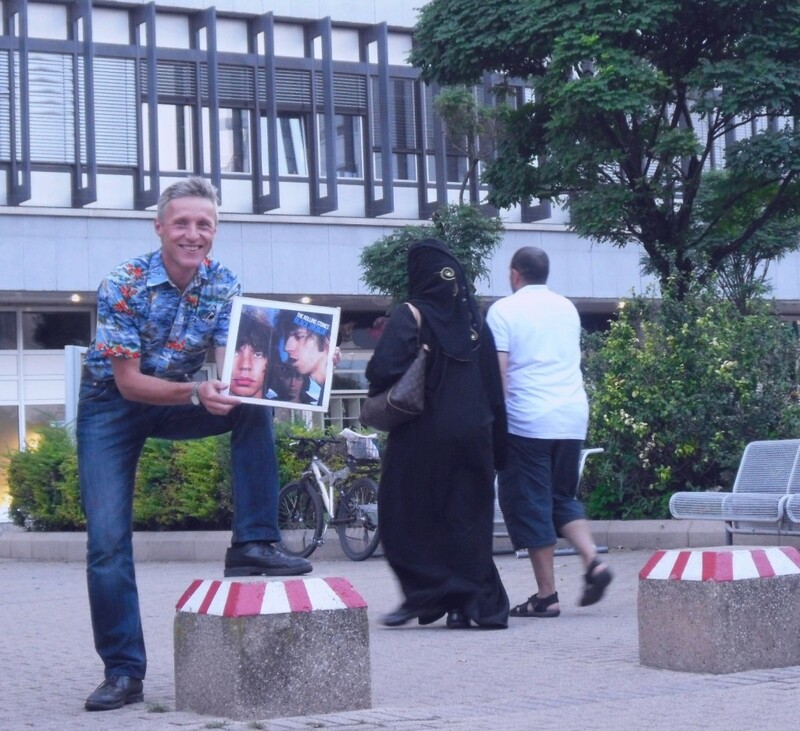 It took me several days to find out a trick, since none of the black veiled women or their husbands were very fond of appearing on a photograph, with reference to the Stones rock music.